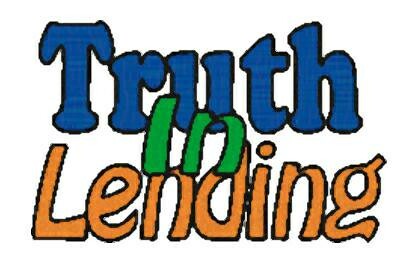 The Truth in Lending Disclosure Statement also referred to as a TIL, is a disclosure to the Mortgagor (Borrower) from the Mortgagee (Lender) that outlines the terms and conditions of the note. This TIL disclosure is one of the most important to understand because it addresses among other things, the type, rate, and terms of the loan. Below is clarification behind some of these terms. Annual Percentage Rate (APR): While the note rate (interest rate) could be considered the nominal rate, the APR could be considered the absolute value. This is because it factors in the cost of the mortgage or closing costs as well. Finance Charge: This is the dollar amount the credit will cost you. Or simply, the amount of interest you will pay by the end of the term. Amount Financed: The amount of credit provided to you or on your behalf. Total of Payments: The amount you have paid after you have made all payments as scheduled. Late Payment Clause: This is a penalty for making your mortgage payment late. This is typically 4% or 5% of the principle and interest payment and is usually late after the 10th or 15th of the month depending on the state. Prepayment Penalty: This is a penalty for early repayment of the loan. Typically this would be seen if sold or refinanced prior to making 24 or 36 payments. This penalty is usually a percentage of the original loan amount. There are two types of prepayment penalties. The first is a hard type. This applies to both sales and early refinances. The other is a soft type which applies only to refinances. Due on Sale Clause: Also known as an alienation clause, this clause states that the new buyer cannot assume the mortgage from the current owner who is selling the home. Therefore, the current owner must pay off the mortgage when sold. Assumption Clause: This clause states that the new buyer can assume the mortgage of the current owner who is selling the home. This clause is most common with VA loans, but is sometimes seen with FHA loans as well. Acceleration Clause: This means the lender can call the entire balance due if you make your mortgage payment late. This allows the lender to begin the foreclosure process. Posted on July 8, 2013, in Finance and tagged Acceleration Clause, Amount Finances, APR, Assumption Clause, Bonita Springs Loan Officer, Cape Coral Loan Officer, Due on Sale Clause, Estero Loan Officer, Florida Loan Officer, Fort Myers, Fort Myers Loan Officer, Lender, Loan, Matt Pell, Mortgage, Mortgage Warehouse, Prepayment Penalty, Property Guiding, Real Estate Financing, SWFL Real Estate, TIL, Total of Payments, Truth in Lending Disclosure. Bookmark the permalink. Leave a comment.